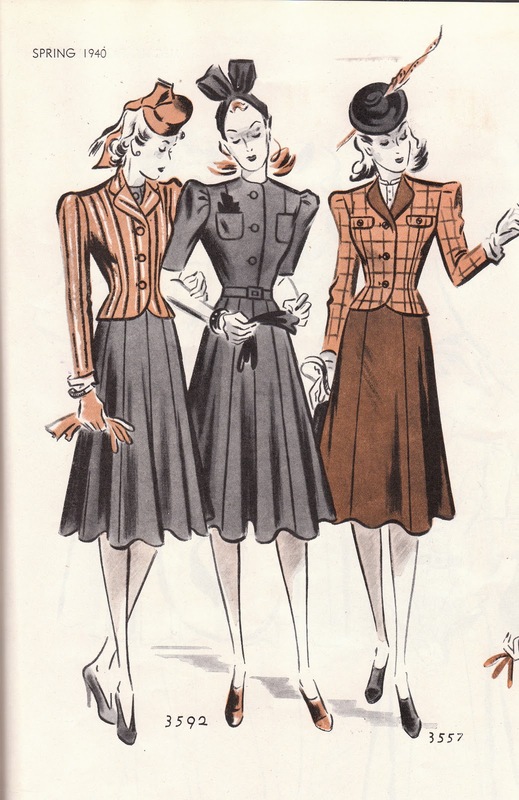 Some more fashion inspiration--this time from 1940. The question McCall's asks is 'suits versus suit frocks'? Hmmmm...which is more versatile? I love this dress (McCall 3588). I actually think the dress looks better with a suit jacket. But I do love the dress details on their own as well (the yoke is cut in one with the front panel). And the suit of the bunch is McCall 3557. I must say this is probably my favorite. I love that the lapel of the jacket can match the skirt. I also love the lines of the jacket! And just look at all the different hats! I love it!! I love the silhouette of the 1940s. Thanks for sharing! I agree with you. That last one is so cute! He, he, almost at the same time we are connected to post. I love the last too. You've got that I like the fashion of the 40s. Yes, those little tilt hats are great. I'm loving the one that looks like rabbit ears. I love the plaid dress on the top right, the shoulders are fab! I'm attracted to the top dress -- on the one hand, it 'looks' as if it's got princess seaming until I realized that the seams don't go over the bustline. I'm going to assume that this is just another 'ring the changes' on a princess seam but it's definitely different. And I have a photograph of my aunt's wedding day from the early 40s in Edinburgh (totally a war time photo; my uncle is in uniform and my aunt and my mum are wearing their best coats, hats, gloves, etc. )and she is wearing a hat just like that, only with a veil in the front and no feather. I absolutely love your blog!!! I like the background of your pictures, You not only shows us your creation but the beautiful town where you live. I was paging through a 1940 Sears catalog and the snood was big news that year. I love snoods! I wonder how long that fad lasted. The jackets in picture too are adorable! They instantly make me think of Edwardian riding habits, updated! 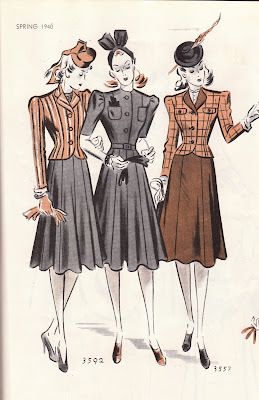 The things I like most about the 30s/40s jacket (besides the nipped waist) is the height of the sleeve cap and the gathering giving it a puffed look (really exagerated in some 30s patterns I've noted). That style seems to have crept into RTW this year, cue modern replicas from the pattern companies one hopes?